Nell McDuffie came to work at the Winecoff Hotel in 1928. She was a capable secretary to several general managers during the next eighteen years. She knew the hotel's operation top to bottom. "I was sort of the assistant manager and just general flunky really," she said. During World War II she moved into the hotel. She survived the Winecoff fire when Atlanta firefighters rescued her by ladder from the window of room 1120, across the ten foot alleyway and into the Mortgage Guarantee building. She was still there when Ed Kiker Williams fell - unconscious - from room 1520 and landed miraculously on the ladder still stretched across the alley - a three story plunge. He was injured but survived. McDuffie later recovered the Gideons bible from her room and claimed it as her own with an inscription. She also typed out some of her special memories of her years at the hotel. Nell McDuffie moved to Raleigh, NC. following the fire but eventually returned to Atlanta. 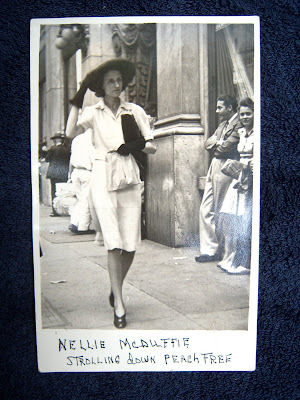 Listen to a three minute excerpt from The Winecoff Fire authors' 1987 interview with Nell McDuffie. 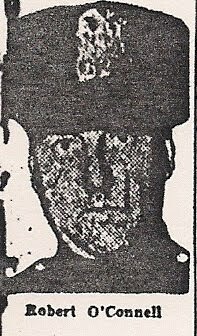 She is asked about co-lessor Robert O'Connell and a disturbance in the hotel's bar on Thursday night December 5th, 1946.